When Dan and Meg Kresach lost their 22-year-old daughter Olivia to an aggressive form of brain cancer, they both wanted to help others facing similar daunting situations, including other young adults being treated at Rush. Article sourced from Rush University Medical Center. To make their hope a reality, the Kresachs started BrainUp, a grass-roots nonprofit to raise funding for brain cancer research and treatment, while building awareness and connecting patients and their loved ones with resources. In just two years since creating BrainUp, the Kresachs have raised more than $400,000 for brain cancer efforts through events and other outreach. According to the American Brain Tumor Association, brain and central nervous system tumors are the third most common cancer in people between the ages of 15 and 39, and the type most frequently diagnosed among people in that age group are gliomas — the type Olivia had. Gliomas have a much lower survival rate than other brain tumors, and the rates have only improved by 3 percent in the last 23 years. Young adults with brain cancer represent only a small fraction of overall brain tumor patients, and as a result research and support are rare specifically for this age group. With these challenges in mind, the Kresachs, from Frankfort, Illinois, especially wanted to help enrich treatment and research efforts locally. 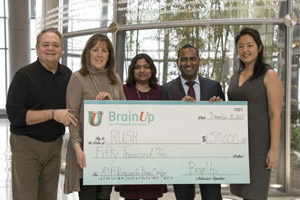 In December 2017, BrainUp donated $50,000 to create the Rush Adolescent and Young Adult Brain Tumor Clinic in order to fill these great needs in treatment and research. In addition to helping others facing similar challenges, the Kresachs are grateful for the treatment Olivia received at Rush under neurosurgeon Lorenzo Muñoz, MD. “Helping patients connect with clinical trials is the best way to push this field forward and give the best treatment options for patients, especially if they are limited by finances,” said Clement Pillainayagam, MD, neuro-oncologist and assistant professor in neurological sciences at Rush, who will be co-leading research efforts. The funding will also support hiring a social worker specially trained to help address the intense life changes that happen in relation to cancer treatment. To support the Rush Adolescent and Young Adult Brain Tumor Clinic, please contact Megan Kono, assistant director of development, at (312) 942-6894 and megan_m_kono@rush.edu.